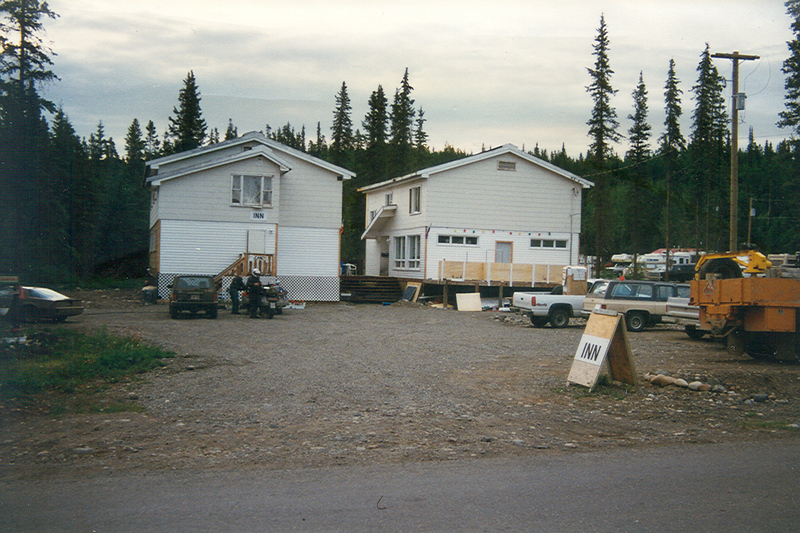 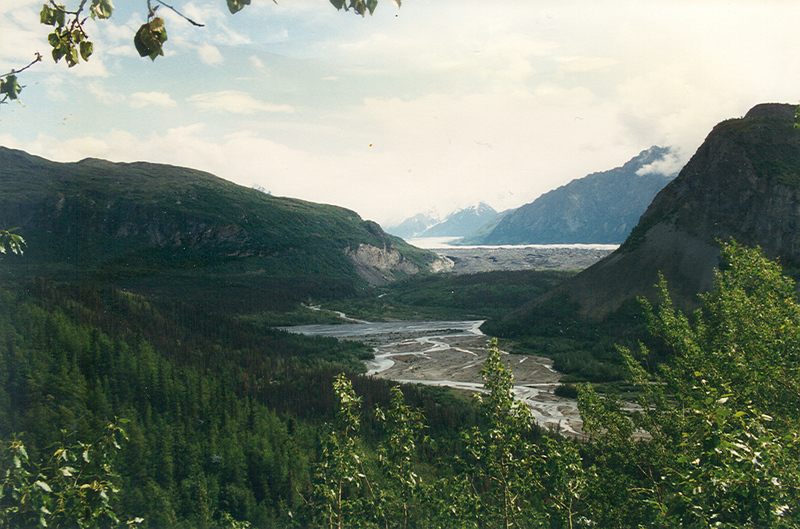 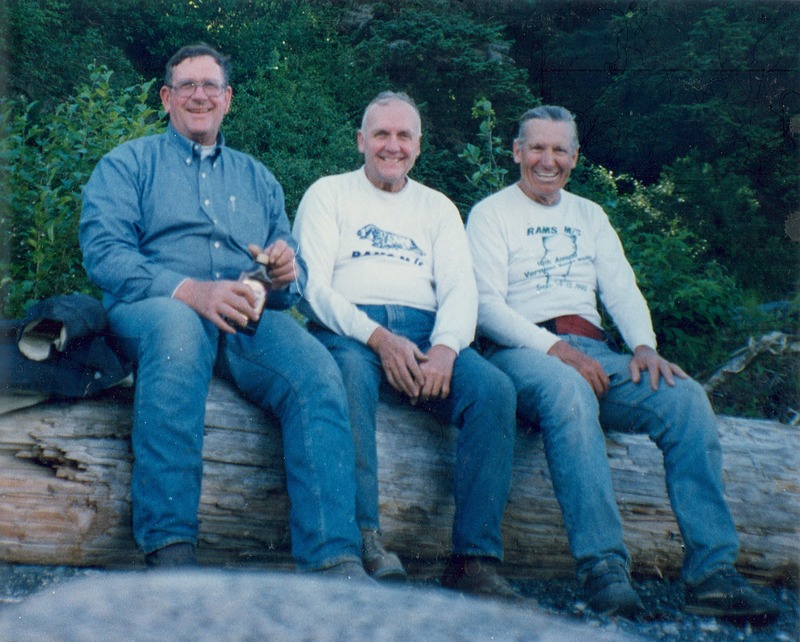 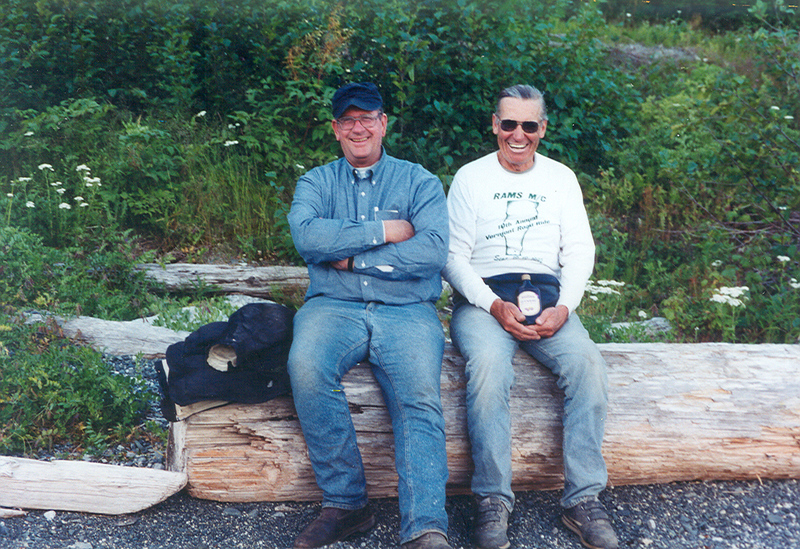 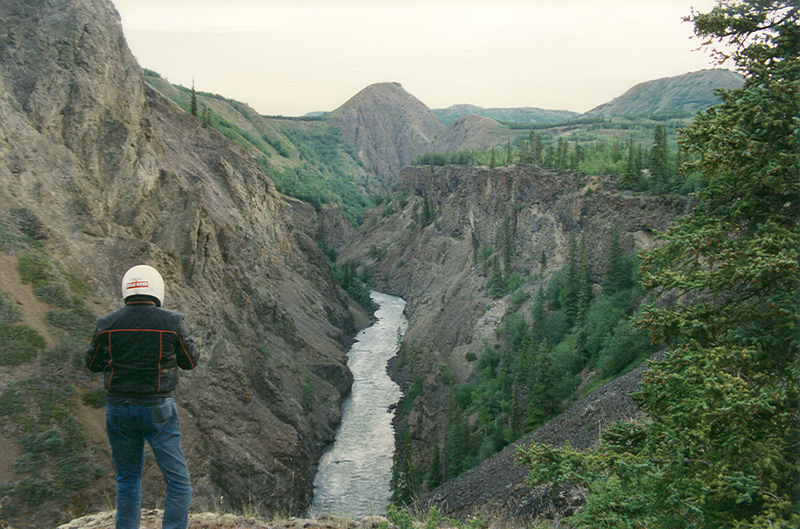 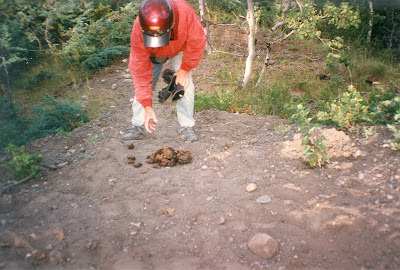 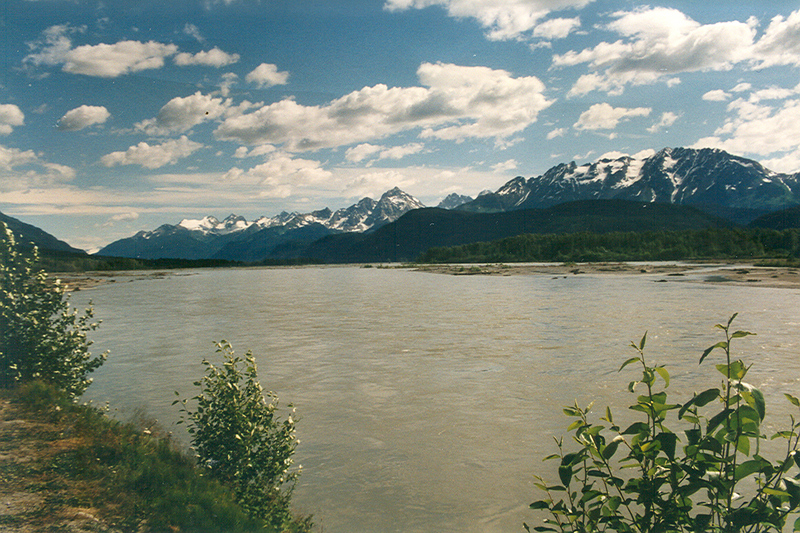 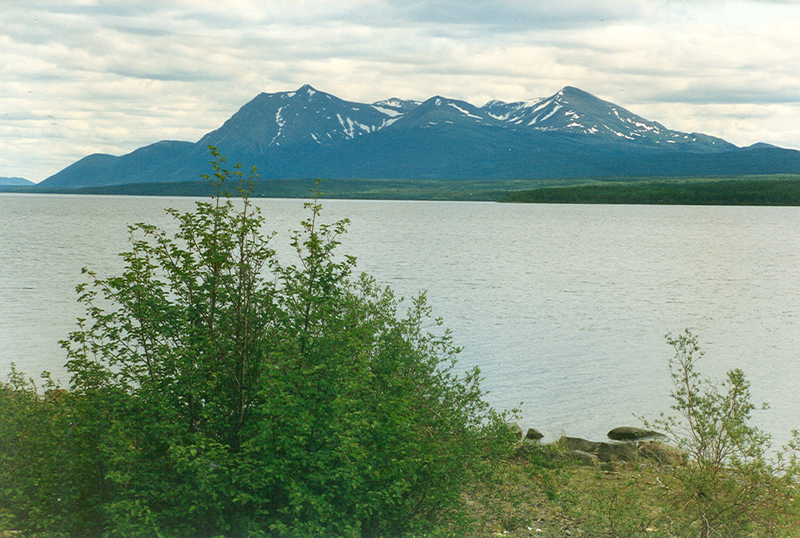 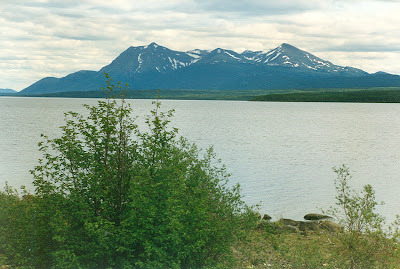 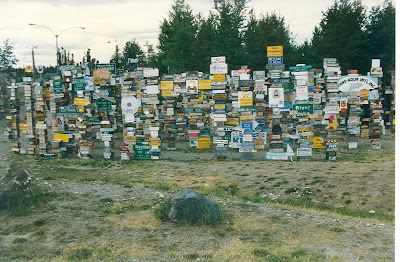 The primary objective of my sixth trip to Alaska in 1996 was to accompany Bud Peck because he didn’t quite make it all the way in 1991 when five RAMS club members made the trip as a group. 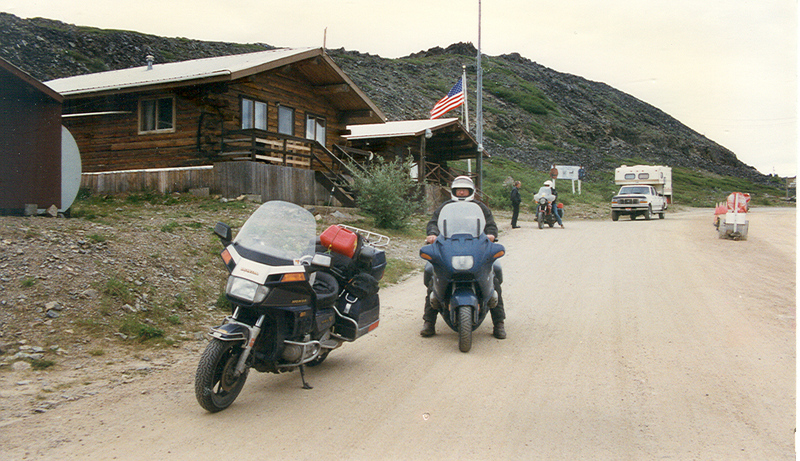 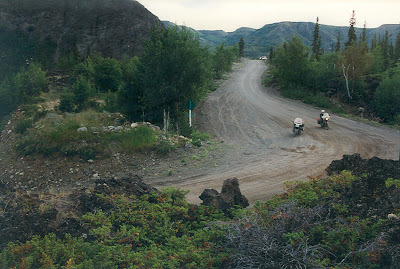 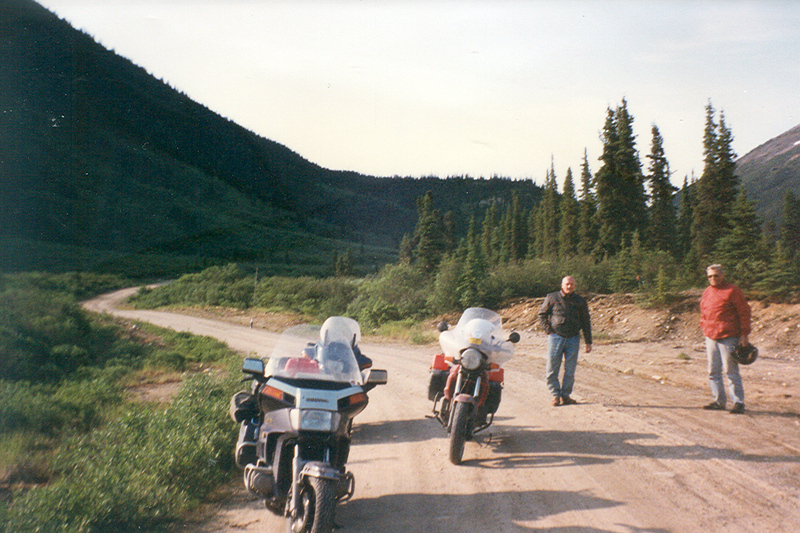 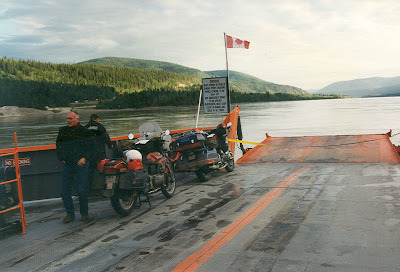 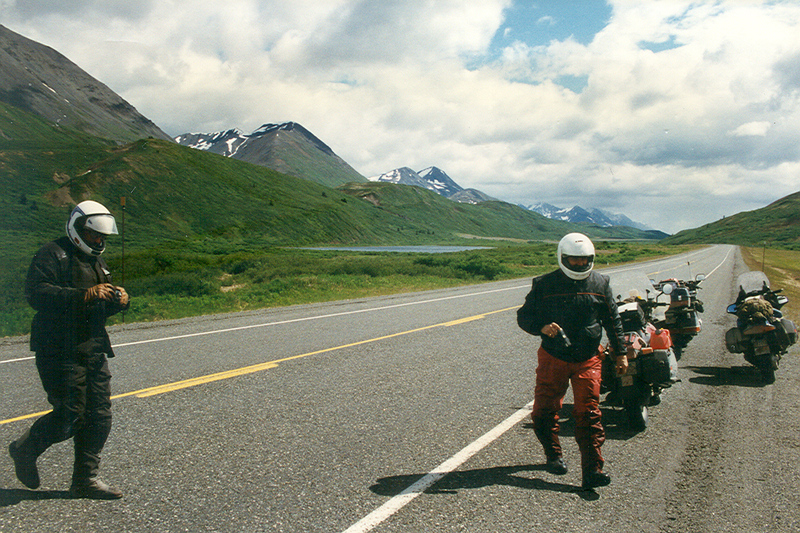 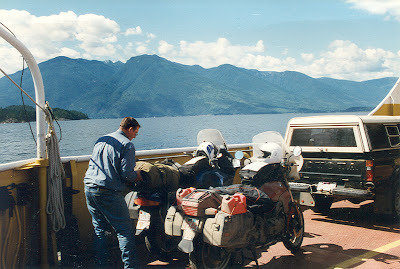 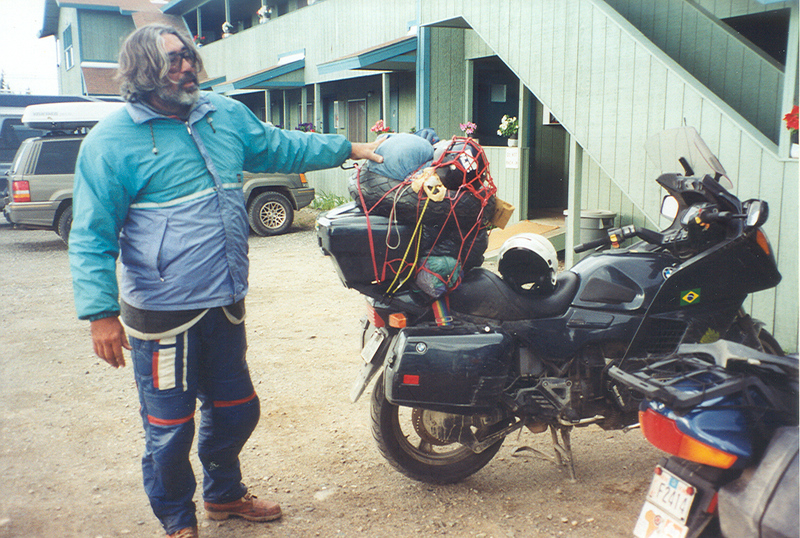 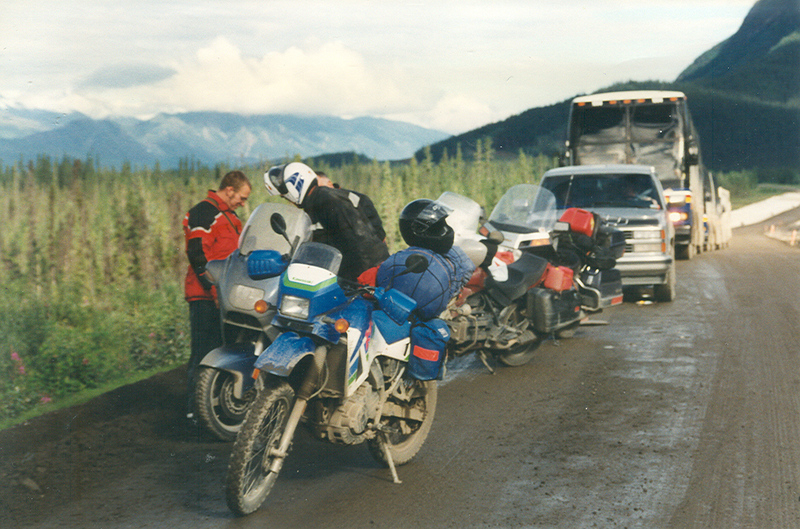 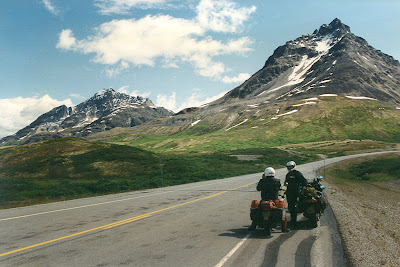 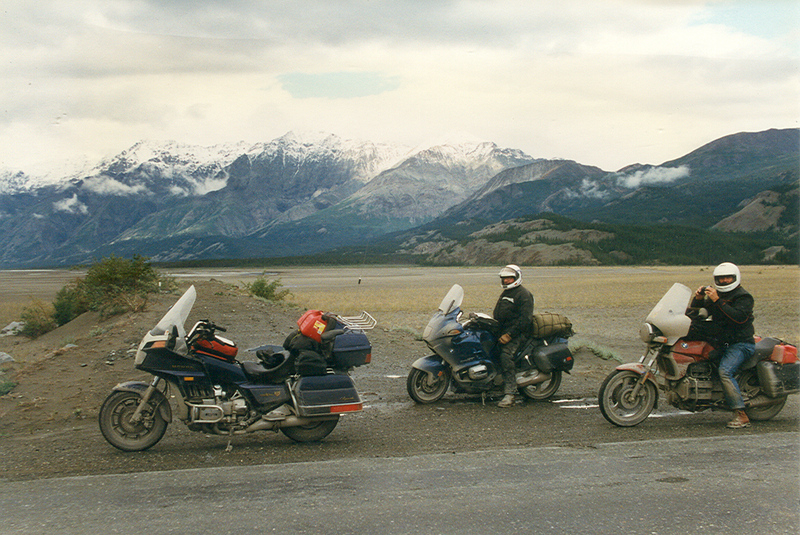 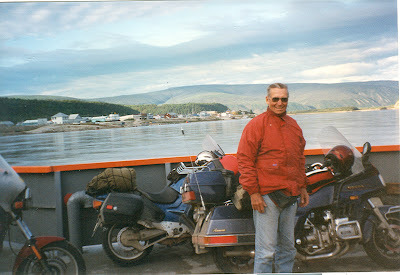 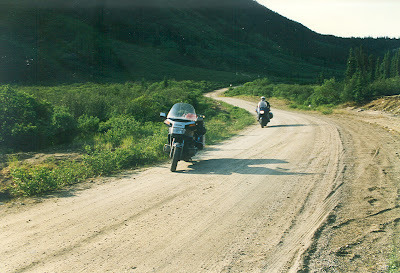 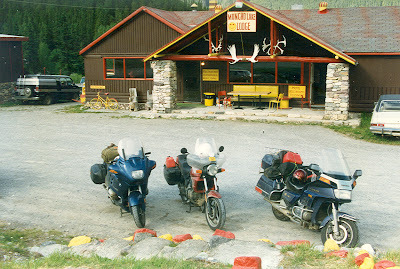 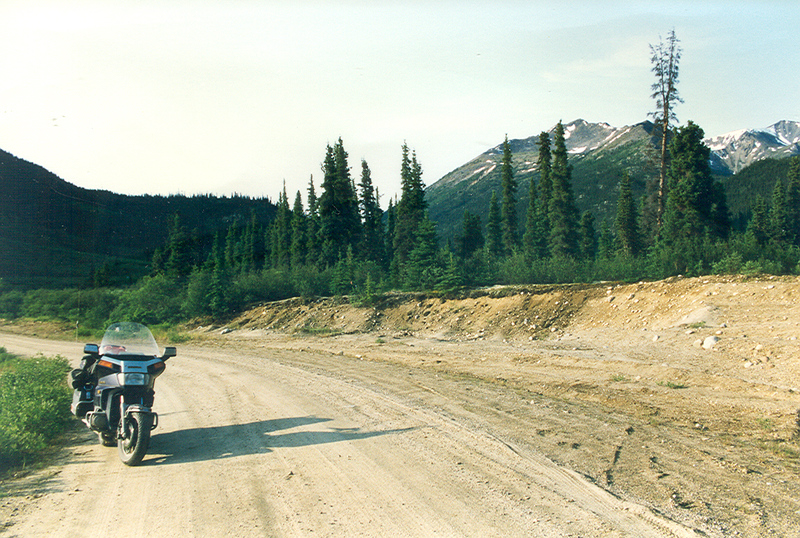 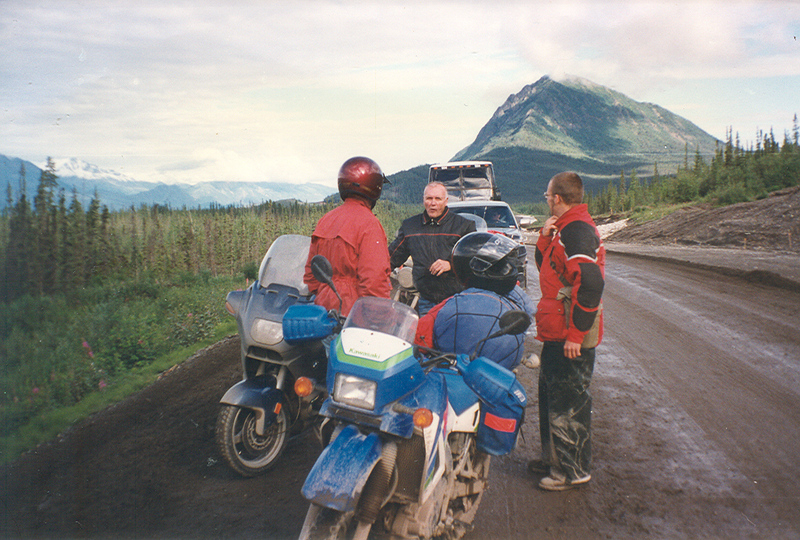 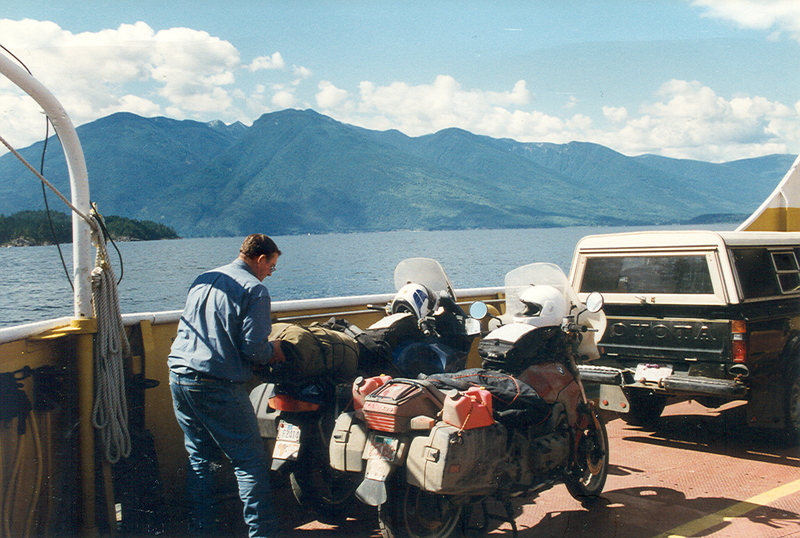 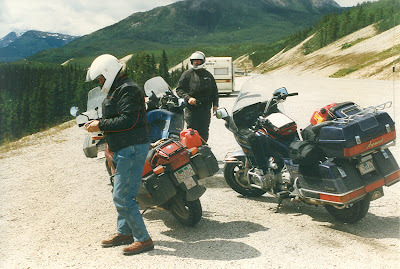 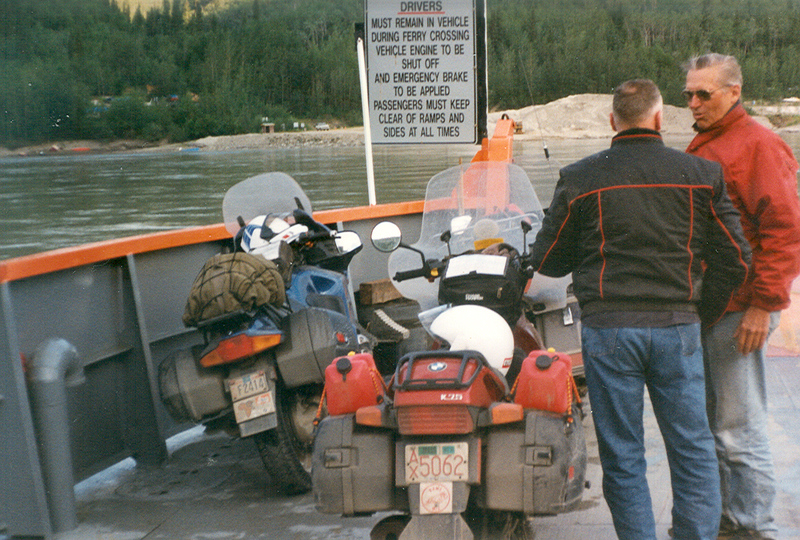 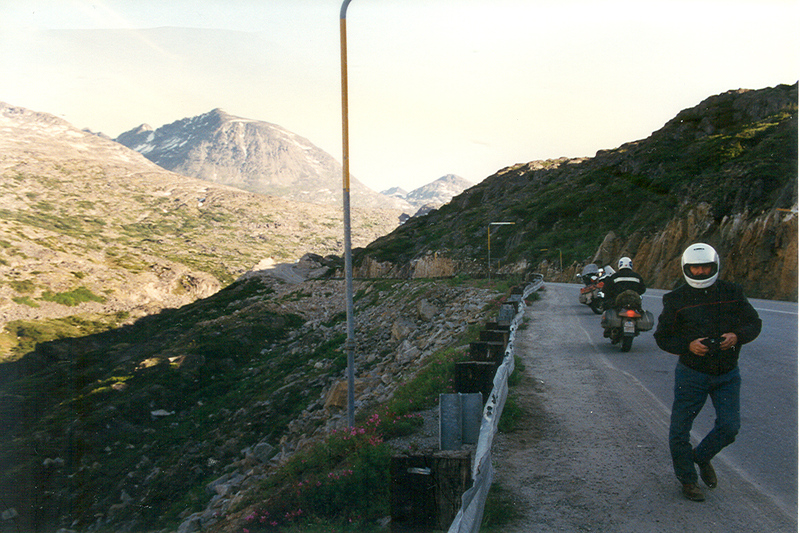 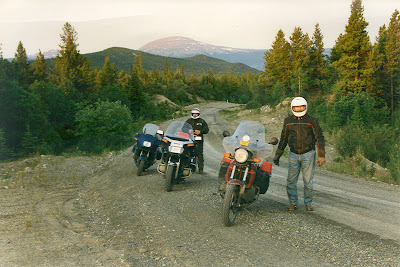 The earlier story was chronicled in a chapter of my book entitled "Alaska 4 - Saga of the Ailing BMWs," when Bud's BMW K75 became one of the ailing ones. 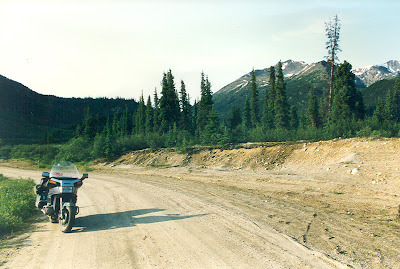 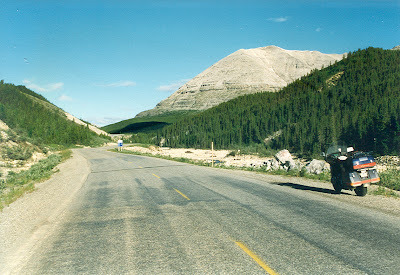 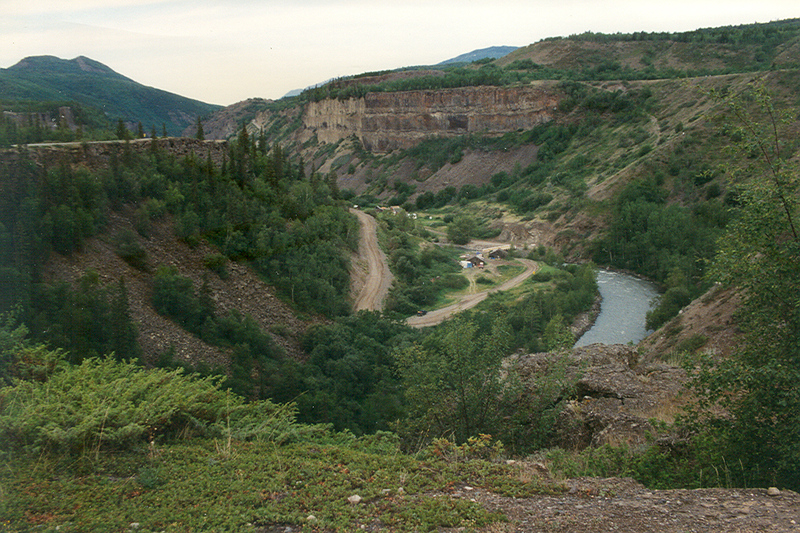 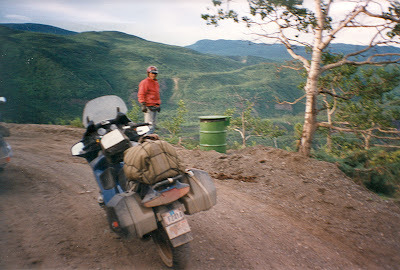 He broke down in the Yukon Territory and didn't get to see many of the attractions like Dawson City, the Top of the World Road, Denali Park, Anchorage, etc. We left him in Watson Lake to wait for parts to repair his bike but hooked up with him later on our way back. 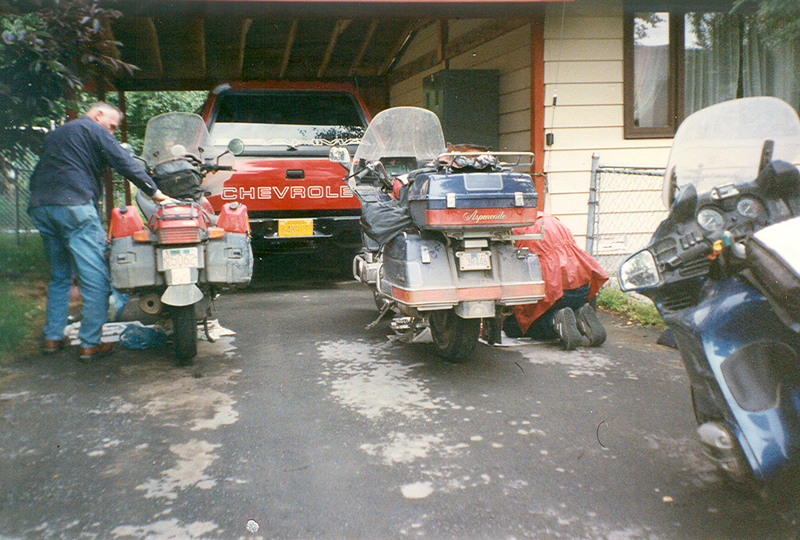 We all got home together safely on both trips. 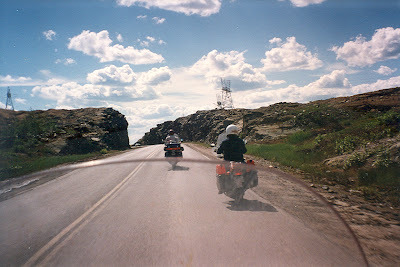 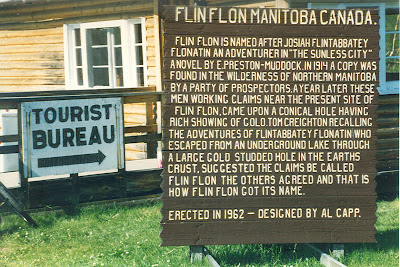 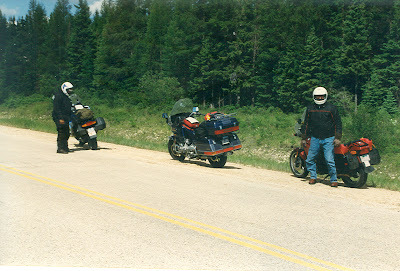 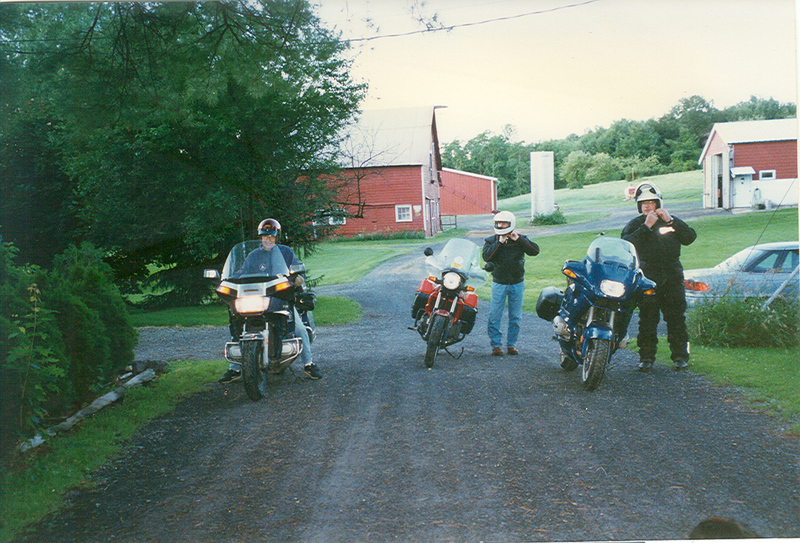 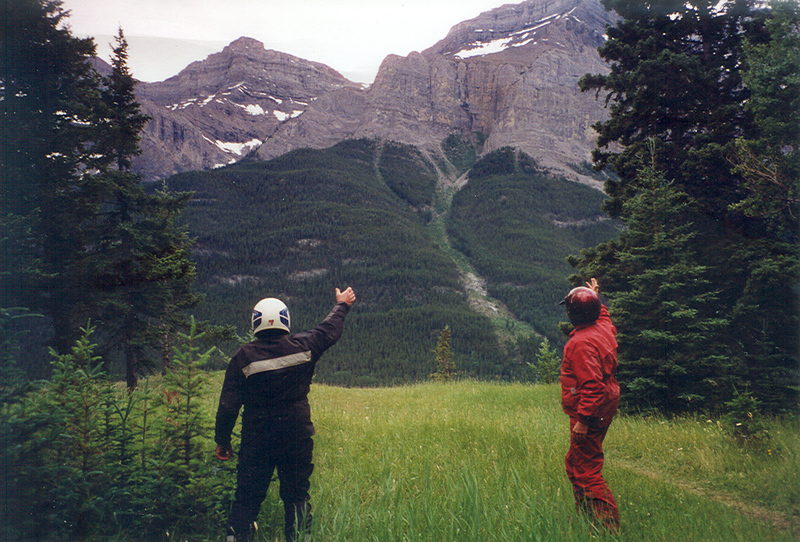 I plotted out a completly different route up and back for 1996 and we didn’t spend a lot of time taking photos. Jake Herzog rode with us. 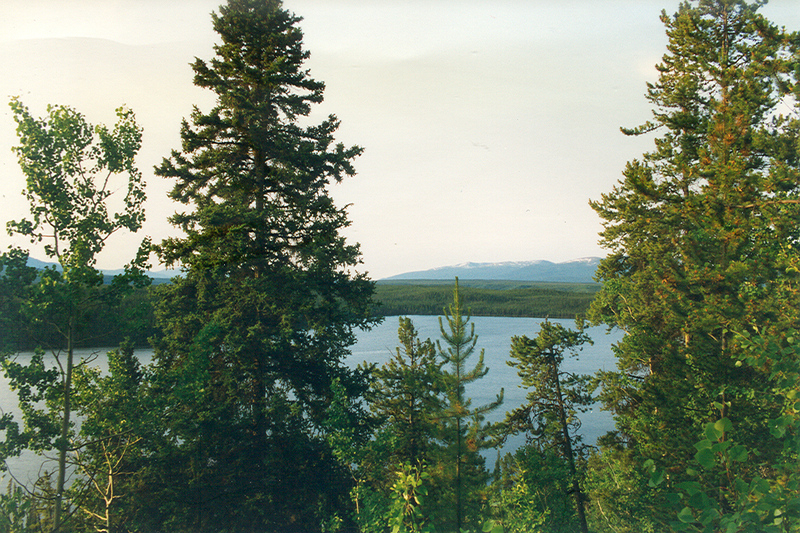 I bought a small wide-angle, throw-away camera and took only a few pictures that I'll post below, along with one photo from Jake's camera. 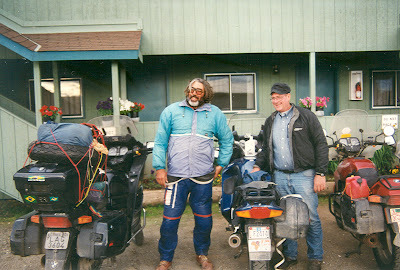 "Day 5 - Having eaten too much too late I didn’t sleep too well. We left at first light knowing it would be a long, tough day with a lot of dirt roads. 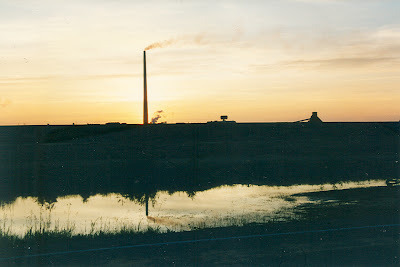 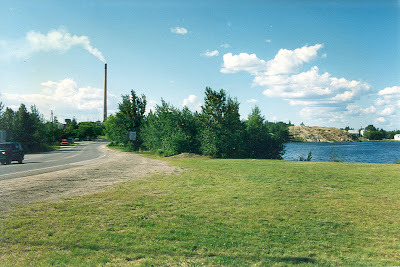 After entering Saskatchewan we had a spectacular view of the sunrise directly behind the huge smokestack in Flin Flon. 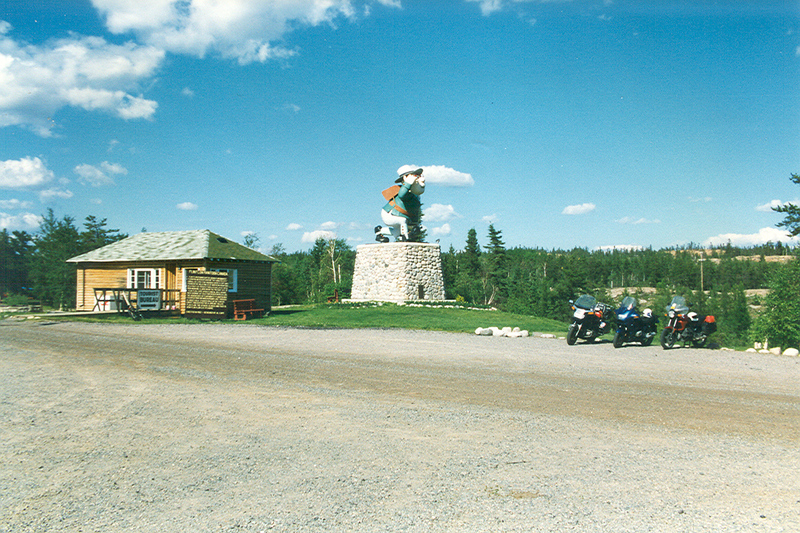 The Saskatchewan border is at the west end the town. The temperature dropped to 46 degrees during our first two hours on the scarcely traveled and very rough road. 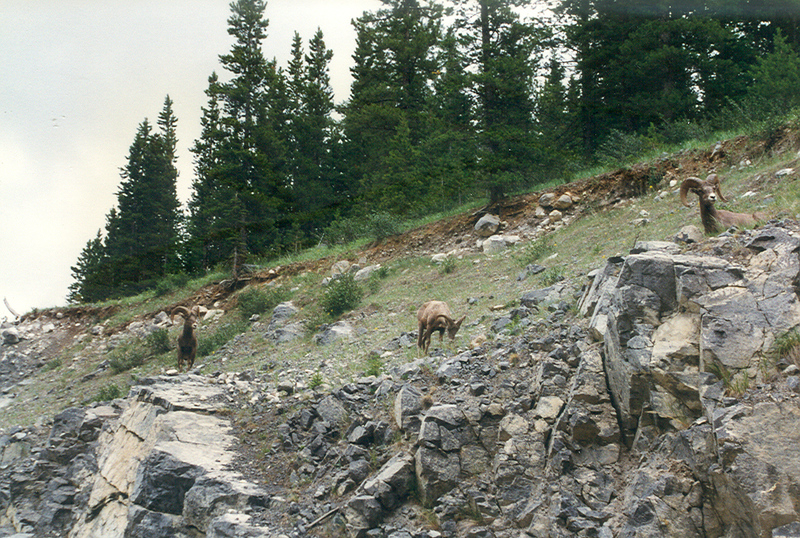 "We stopped in the middle of the road around eight o’clock for a nature break. 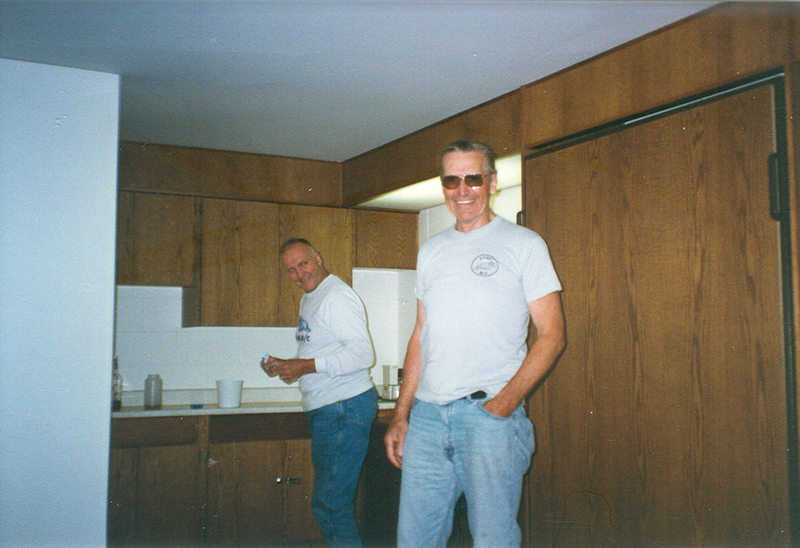 Bud said, "What are we doing about breakfast?" I reached into the trunk of the Gold Wing for a can of sardines. 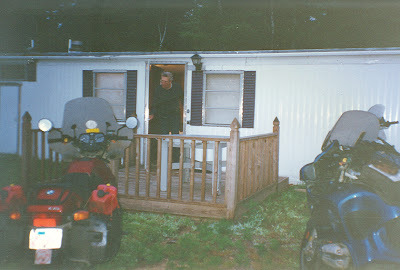 Bud’s first remark was, "You’ve got to be kidding." Breakfast in the middle of the dirt road consisted of canned sardines and granola bars; and although Bud refused to partake of the sardines, he was carrying a few sticks of his own beef jerky. 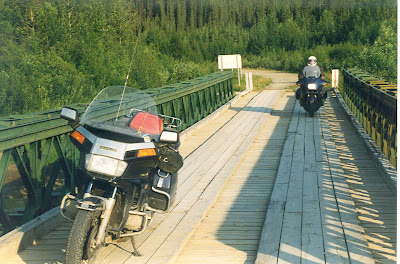 Many flies, gnats, and huge mosquitoes swarmed around as we ate. 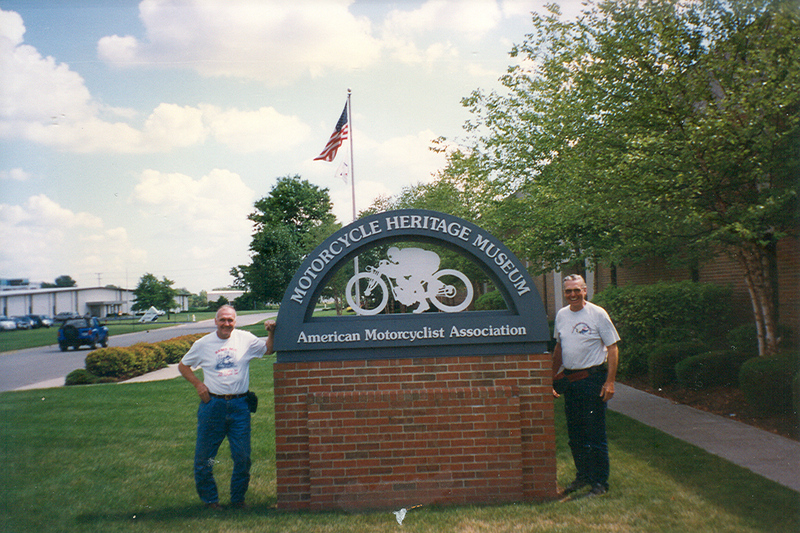 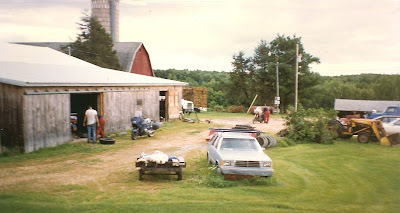 "We rode about 65 miles of rough dirt roads to reach Rte. 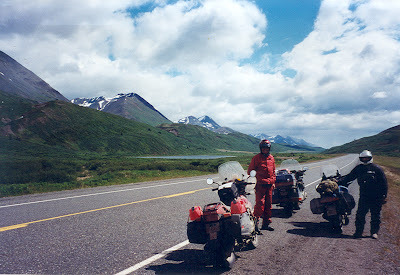 2, where I planned to get gas. 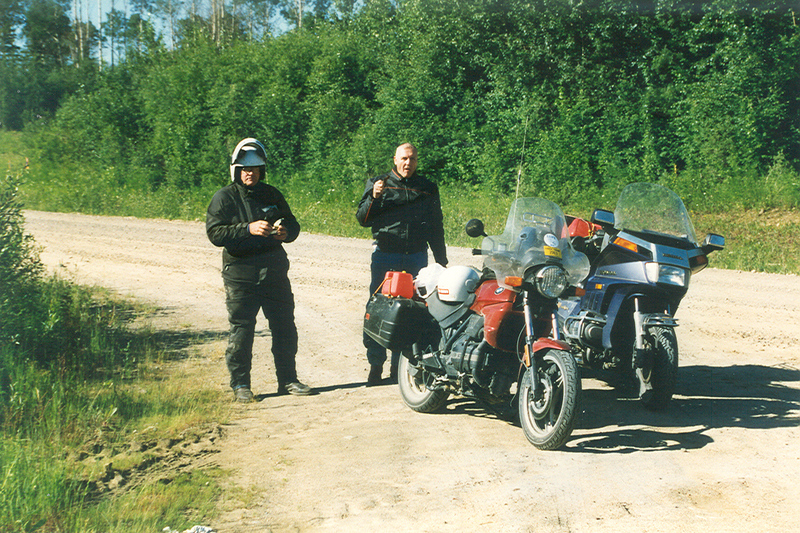 We found no gas near the intersection so we went north into the town of La Ronge. 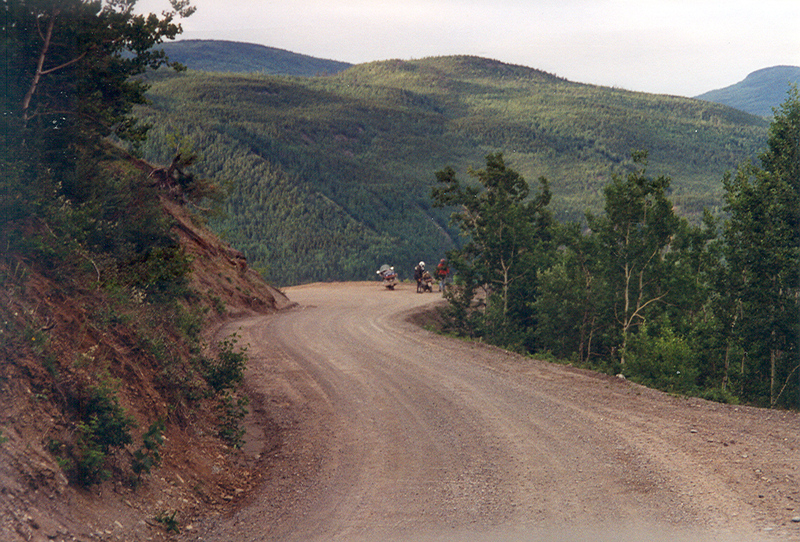 We encountered considerable construction in the next 100 miles, with much loose dirt and coarse gravel. 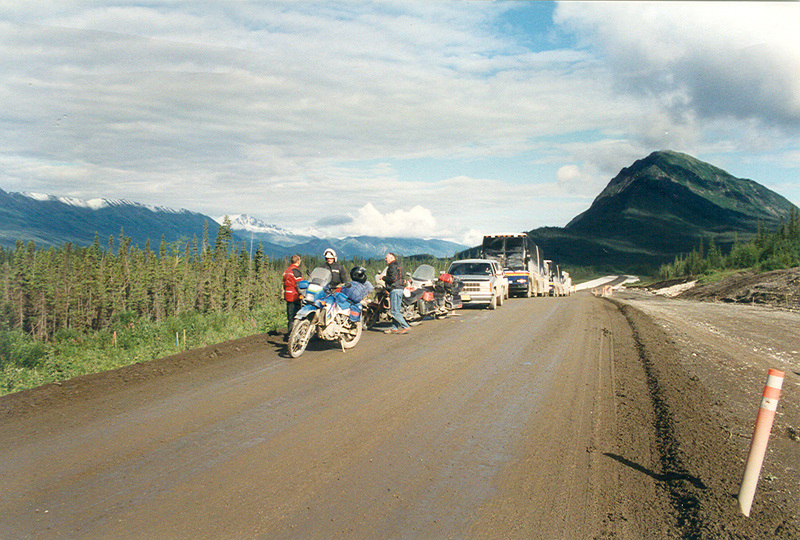 We met logging trucks traveling in both directions on the dirt road. Upon entering Alberta the roads improved. We saw wheat and canola growing and cattle grazing in the fields. 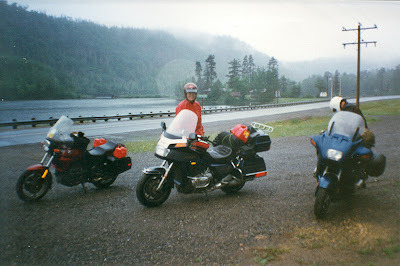 It rained for the last 20 miles of the day. 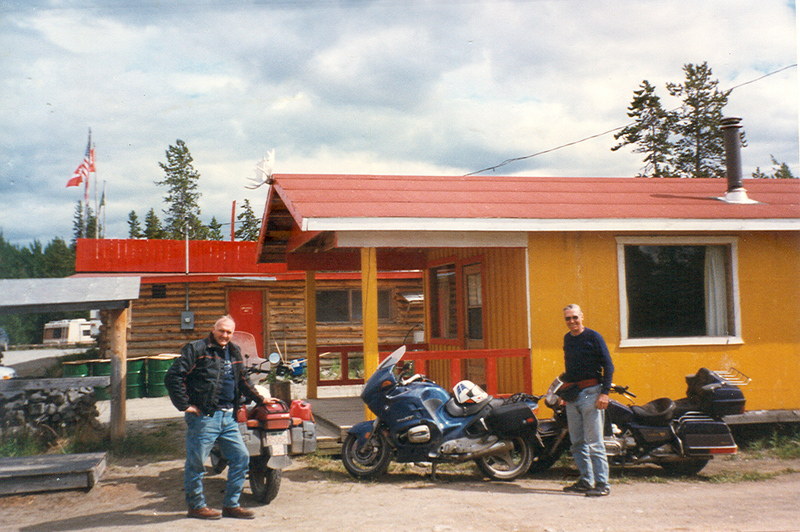 Our reservations were at a beautiful, modern inn at Athabasca. It was by far the longest and toughest day of our trip. 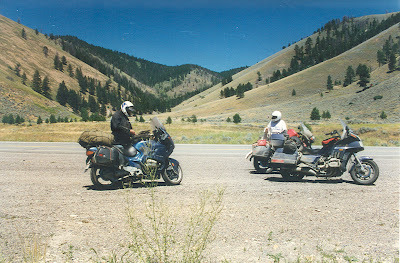 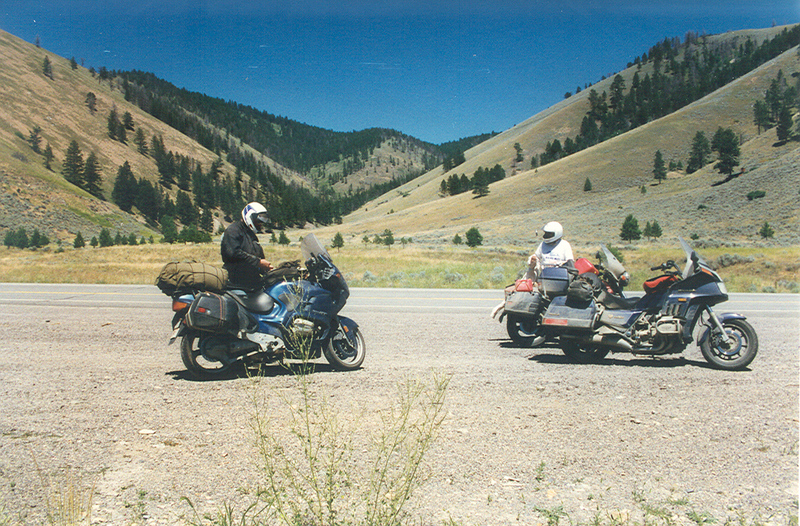 We covered more than 700 miles in 13 hours, of which about 175 miles was on loose dirt and gravel." We could see the entire rainbow. 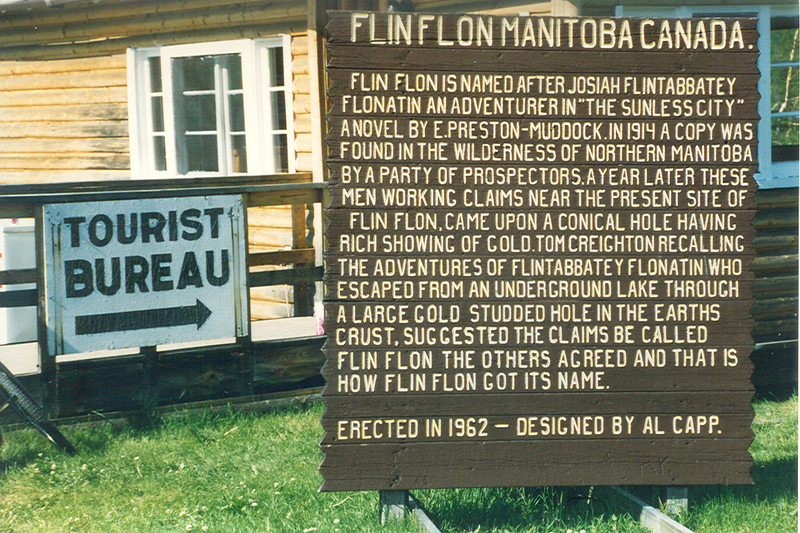 Leaving Flin Flon behind at first light. We left before any breakfast places were open. 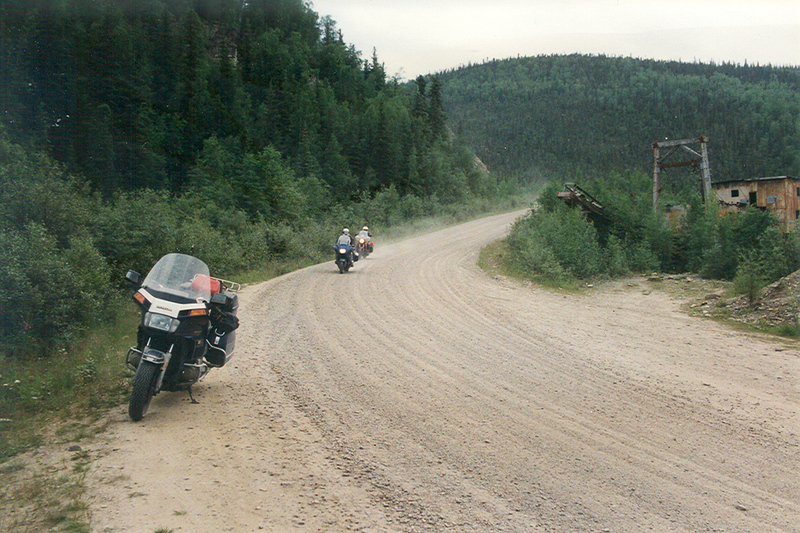 Not much traffic in this part of Saskatchewan. We were stopped for road construction on the AK Highway. Signpost Park in Watson Lake, YT gets bigger every year. Cabin at Mukluk Annie's on the Alaska Highway - upgraded from past years. 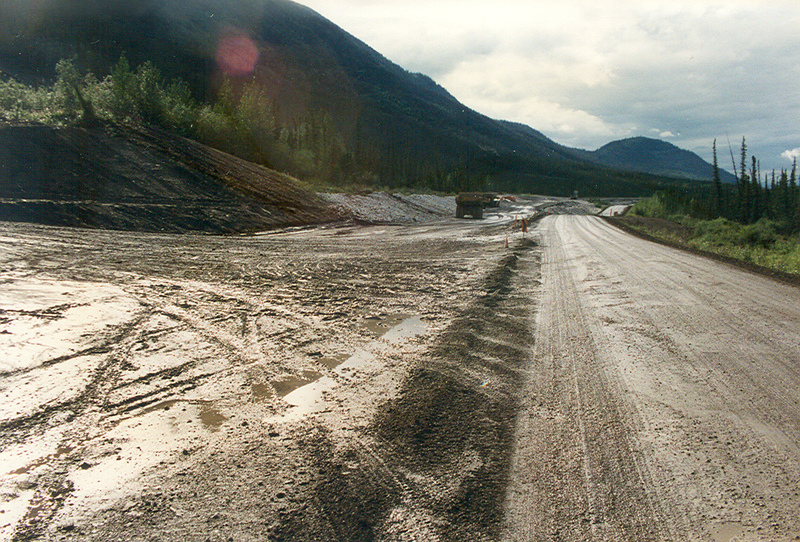 The highway here was in great shape. 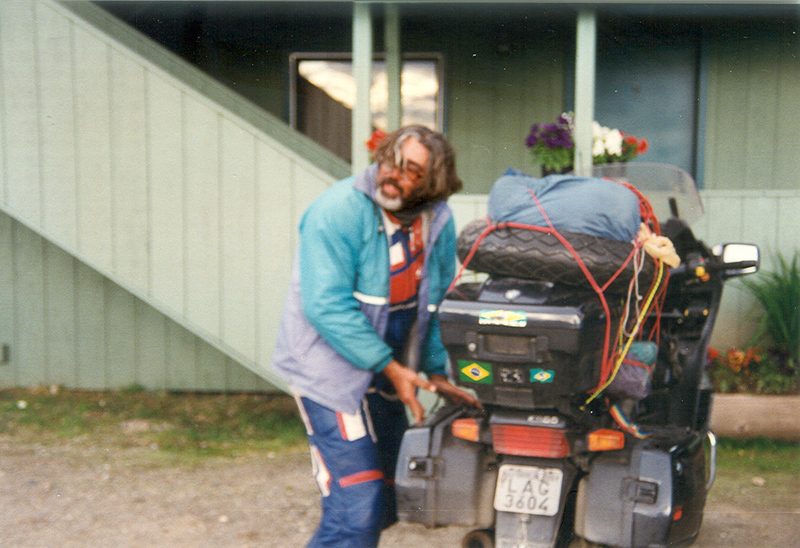 Guy from Brazil found Jake's saddlebag along the road. We're changing oil at Rey and Becky's house in Anchorage. 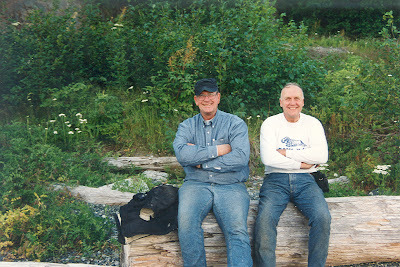 At Haines, AK, waiting for the cruise liner to take us to Skagway. 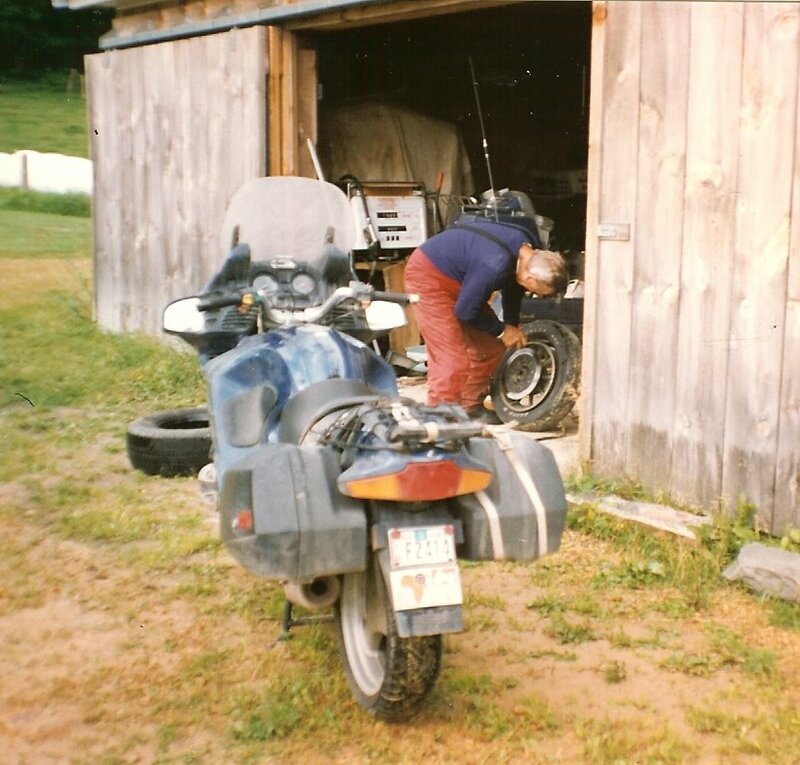 Stopped at Phil Bourdon's to change a tire on my bike. 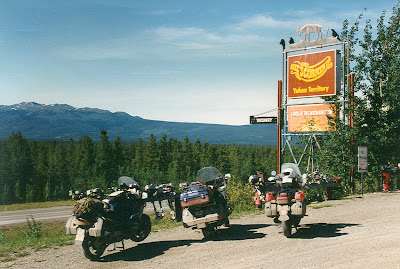 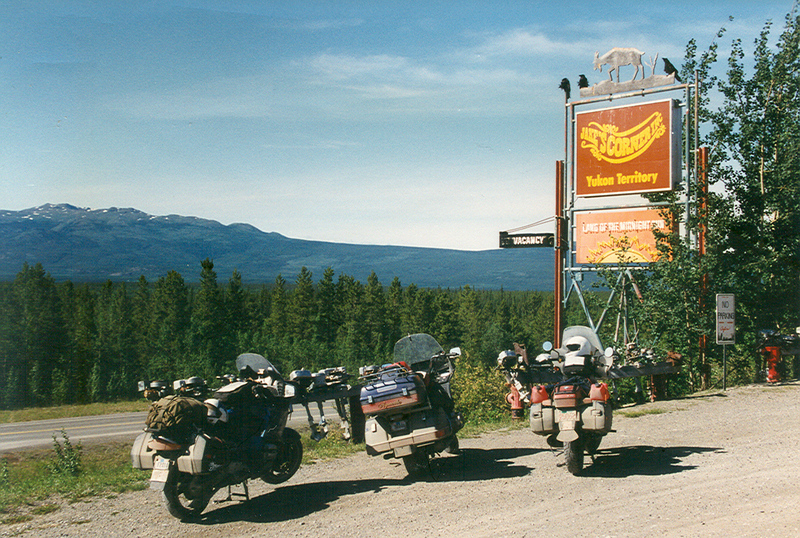 Great motoring adventure, and not to mentioned - those bikes are really cool.